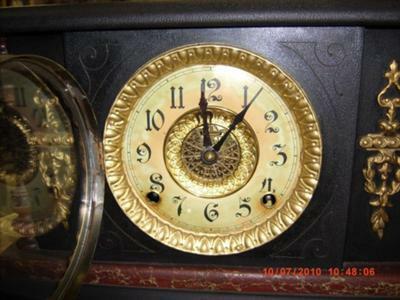 Recently, I stumbled accross this 1880's Ingraham mantle clock at a local thrift store. I had a rough idea of these clocks value, and this one is in exceptionally nice condition(looks almost new, other than a small depression from where the bezel opens). In trying to find a true value to it's model, I've not seen another exactly like it after browsing hundreds of pictures online. Does anyone know it's exact model name and it's value? I seem to only be finding half a dozen similar models repeatedly, and am beginning to think I managed to find a more limited production model. The movement is original, and working, as is the finish on the casing. 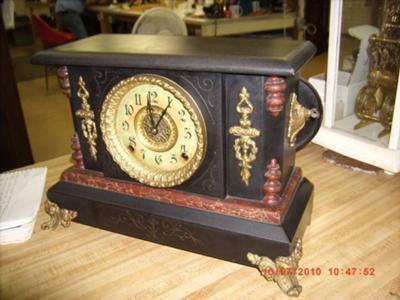 It is a 1/2hr-hour chime with a coil gong.